This exclusive all-in-one package features all the necessary essentials for your new arrival. We've carefully selected the best products for you, taking the hassle out of looking for individual items separately. Day3 Chassis including front and rear wheels. Q highchair & junior chair. Cozi Sleeper Multi-functional bed side crib. Don't miss out and take advantage of this amazing deal. Everything you need for a newborn at an incredible saving. Wont last for long and once it gone, it’s gone. The Joolz Day³ is made to navigate in elegant comfort. The premium look and features cleverly blend style and functionality, making it the perfect pushchair for parents that love design. The innovative see-through cot ventilation allows a flow of fresh air, whereas the head cushion on the soft breathable mattress and adjustable footrest provide extra ergonomic support for your child. The seat at table height can be used as a highchair. And thanks to the easy compact one-piece folding, the Joolz Day³ can easily be stored, even in an upright position with the seat attached. Compatible with the following car seats: Joolz iZi Go Modular by BeSafe, BeSafe iZi Go and iZi Go Modular, Maxi-Cosi CabrioFix, Pebble & Pebble Plus, Kiddy Evo-Lunafix & Evolution Pro 2 (also in reclined position), Cybex Aton, Aton 4, Aton Q & Cloud Q (also in reclined position), Nuna Pipa. You arrive – at the beach, at your parents, or that lovely boutique hotel – and the baby has fallen asleep. But luckily you don’t have to waken them. You just click the car seat onto your Joolz pram using the Joolz iZi Go™ Modular by BeSafe®. Safe, elegant and light: this car seat combines Dutch Design with Scandinavian safety. Joolz and BeSafe continuously search for solutions which makes the lives of the parent and child more positive and safe. Their shared value is to protect what is most precious to us: our children. Two companies, honoured with several awards and dedicated to the development of the best products for being on the move. The perfect collaboration. Easily click the Joolz iZi Go™ Modular car seat onto your Joolz with the matching adaptor set (which is available seperately). Safe, elegant and light: this car seat combines Dutch Design with Scandinavian safety. The BeSafe iZi Go Modular can be installed using either the standard three-point car seat belt routing or easily clicked into place using the optional iZi Modular i-Size base (the iZi Go Modular car seat only complies with i-Size regulation when used with the ISOFIX base). iZi Modular i-Size base sold separately. The unique combination of EPS and foam in the seatshell together with soft padding, makes BeSafe iZi Go a very comfortable babyseat for your child. Keep baby close with the Cozi Sleeper crib. Suitable from birth until baby is 9kg. Cozi Sleeper has a 5 position height adjustment system and converts from a stand-alone crib to a bed side crib. A padded mattress with soft quilted sides and a ventilated drop side ensure your baby's comfort. Soft quilted sides for extra comfort. Storage bag for easy transportation. The Babylo Q Wooden highchair is a modern design using modern materials, making it the ideal choice for a fashion-conscious home, and a practical choice for your little one. in addition to the modern style, the q converts simply from a highchair to a toddler chair. also, it comes fitted with a cushioned seat pad for comfort and the 5-point over the shoulder safety harness ensures security for even the most wriggling of children. the tray has 3 positions and the removable tray insert can be placed into the dishwasher, making the clean up after the messiest meal times a doodle. Suitable from 6 months to approximately 3 years of age (15kg). An ideal highchair for weaning and eating alongside the rest of the family. Modern and lightweight, with wipe clean surface. Cushioned seat padding with PU leatherette finish. 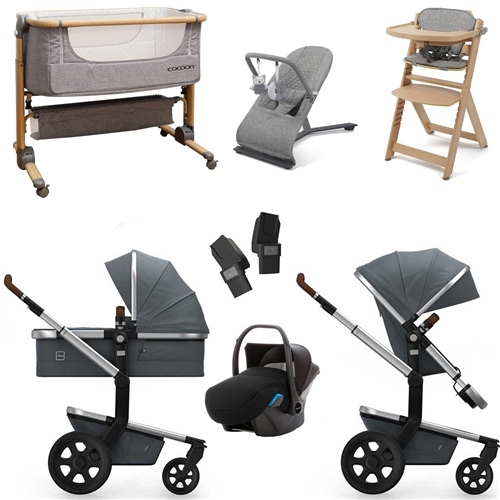 Jane Complete Nursery and Travel system starter package.